Windows Live Messenger is celebrating its 10th birthday with all the glitz and gift for its users. To mark this occasion, Messenger team has released free gift pack download that contains cool winks, emoticons and other stuff to dress up your Windows Live Messenger. Grab the download pack to get into spirit of celebration. 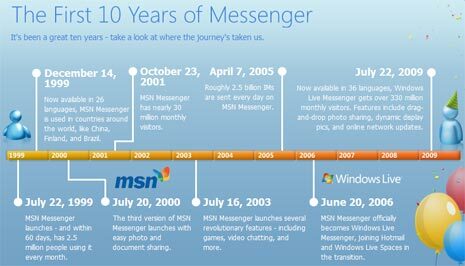 Messenger journey started on July 22, 1999 – within 60 days of launch it had 2.5 million users. Over the years it has refined in looks and features. Now, as on July 22, 2009 – messenger has over 330 million users with support for 36 languages and host of features like: drag drop, photo sharing, network updates etc. 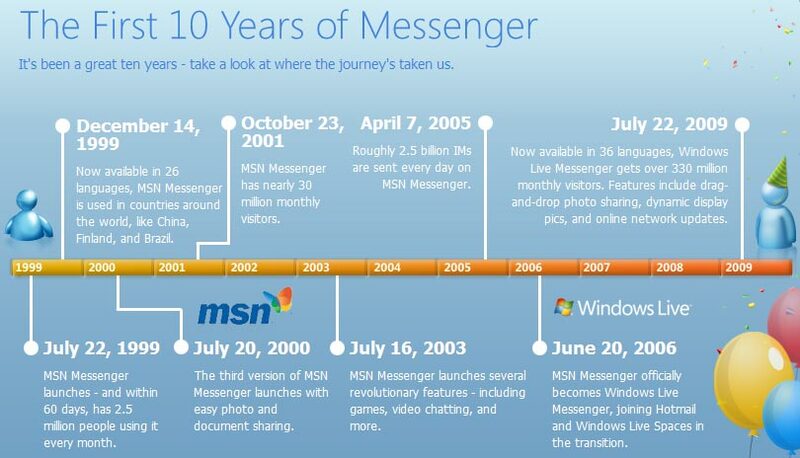 Checkout above image that traces Messenger journey over this period of 10yrs. Messenger for sure has been happening during this 10yrs period and all set to stay around with Microsoft taking good care of this child!